In context of sharing of responsibilities between women and men, including our roles in the care giving of AIDS victims, the focal point of this conference was to discuss "The role of the family in building social and Economic security for humanity". The importance of understanding the concept of shared responsibility within the family is a priority in all cultures. The family unites all humanity across cultural and national boundaries as well as the essentiality of basic and continued care-giving measures. This includes the important economic, medical, psychological and social infrastructure concerns in combating the devastating and multiplying impact of AIDS on the family. 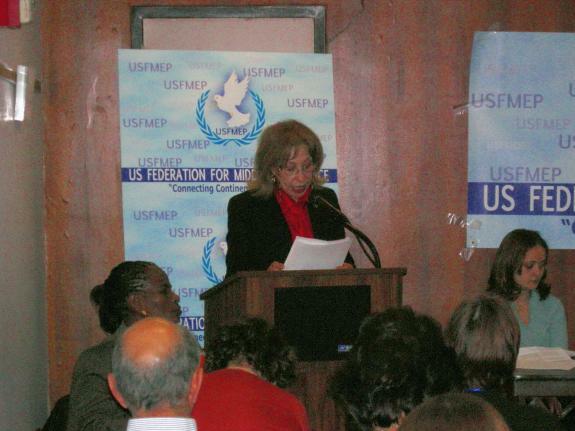 This side event was hosted by the U.S. Federation for Middle East Peace (“USFMEP”) and co-sponsored by the Association National AL HIDN, Morocco. The discussion, moderated by President of USFMEP, Mrs. Sally Kader, explored the importance of the concept of shared responsibility within the family as it relates to cultures across the world. The panel analyzed how economic and social insecurity within the family can impact society. Additionally, the panel highlighted the importance of family values in the prevention of the AIDS epidemic in addition to the necessity of providing psychological support for AIDS victims.